Posted on May 09, 2013 at 5:00:20 am by Michelle M.
After much anticipation, and what felt like one of the longest winters ever, spring is finally here! The smell of BBQ and the sounds of children’s laughter fill neighborhoods throughout the city. Bicycles are dusted off and families set out on Fort Wayne’s abundant trails. Puppies become eager for walks and we dig through the cabinet to find sunscreen and that great pair of sunglasses from last year. Suddenly landscapes turn green and beautiful flowers begin to bloom. There’s nothing like those beautiful spring days to give hope and happiness to all of us. During spring, Fort Wayne is filled with beautiful flowering trees and plants that bring magic to the scenery that simply can’t be duplicated outside of nature. Here are a few spots you can find gorgeous spring blooms this spring to enjoy: Foster Park, located at 3900 Old Mill Rd, is one of the most popular places to enjoy spring blooms. In fact, they update the floral display each season so there’s always something to enjoy. Boasting 32 flowerbeds and over 15,000 annuals this garden is not to be missed! Delight your senses with an array of spring flowers, beautiful benches tucked in for quiet reflection, and a quaint walking path to get up close to nature. Lakeside Park, nationally recognized by the All American Rose Selection Display Garden, boasts a rose garden unlike others in Fort Wayne. It’s the site of many romantic proposals, weddings, and lazy afternoon picnics. With over 1,500 roses on display and reflecting pools the Rose Garden is sure to bring out the romantic in everyone. Freimann Square, located in Downtown Fort Wayne is a local favorite. With the beautiful fountains, lush green grass areas, and thousands of spring bulbs and annuals, it’s sure to make you smile. Attending a meeting downtown while you’re in town? 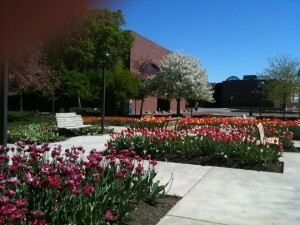 Sneak over to Freimann Square for a few zen moments between meetings. You’re sure to be refreshed. 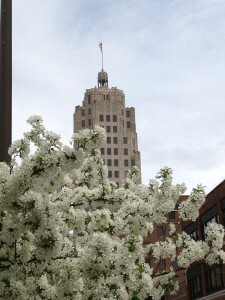 Downtown Fort Wayne is also in bloom throughout the spring with beautiful flowering trees and plants. Take in the gorgeous, historic Allen County Courthouse while enjoying the beautiful blooms planted in the Courthouse Green. These are sure to provide a sense of peace during your stay in downtown Fort Wayne.